The South African platinum mining industry has been affected by strikes for more than ten weeks now. Because stocks are dwindling, the mining companies concerned are finding it increasingly difficult to fulfil their contractual delivery obligations. The situation as regards palladium is dominated by concerns about how Russia might react if the West were to impose further-reaching sanctions on the country. At the same time, demand on both markets is robust, driven by the automotive industry. The situation appears to be tightening noticeably, which in our opinion suggests that platinum and palladium prices will rise. 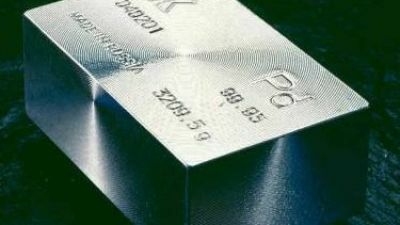 Platinum came under pressure from the weak gold price in March and declined noticeably as a result. For a time it dropped below the $1,400 per troy ounce mark to a six-week low. Palladium fared somewhat better and trended sideways while fluctuating significantly. For the first time since August 2011, it actually exceeded the $800 per troy ounce mark for a while, though it was unable to maintain this level (Chart 1). We believe that both precious metal prices are too low from a fundamental viewpoint given the risks to supply. In this Commodity Spotlight we will be assessing the supply situation in South Africa, the world’s biggest platinum producer and the world’s number two palladium producer, as well as taking a look at Russia, the biggest supplier of palladium. According to figures from Johnson Matthey, South Africa produced 4.12 million ounces of platinum and 2.35 million ounces of palladium last year, thus accounting for 72% of global platinum mining production and 37% of global palladium mining production (Chart 2). Palladium is generally mined together with platinum. However, a strike has been underway in the South African platinum mining industry since 23 January. The radical AMCU (Association of Mineworkers and Construction Union) called its members out on strike to lend emphasis to its calls for wage hikes. The union, which was established in 1998 and formally registered in 2001, represents the majority of workers in the platinum mining industry and has meanwhile overtaken the more moderate union NUM (National Union of Mineworkers) in terms of membership. The world’s three biggest platinum producers are affected: Anglo American Platinum, Impala Platinum and Lonmin, 87% of whose workers are union members. Accounting for 66% of these, the AMCU predominates (Chart 3). Over 70,000 workers went out on strike when called upon to do so. The strike is the biggest to hit the South African mining sector since the Apartheid regime ended in 1994. 350,000 workers took to the streets in 1987 to protest for better working conditions, though this strike was brought to an end after around three weeks and cost the mining companies around ZAR 250 million at the time, according to the NUM. The AMCU is calling for producers to increase wages significantly, its core demand being that entry-level salaries be doubled to ZAR 12,500 per month. Originally, the AMCU urged the mining companies to meet its demands immediately, though it has meanwhile shown itself willing to “make some concessions”. AMCU has “eased” its core demand in two stages, with the result that it now wishes to see wages doubled within four years. For their part, the companies have offered staggered wage increases over the course of three years – 9% in the first year, 8% in the second and 7.5% in the third. In February, the rate of inflation in South Africa was 5.9%. In other words, the two parties still maintain positions that are very far apart. To date, the state mediator engaged to help (CCMA – Commission for Conciliation, Mediation and Arbitration) has failed to bring the two parties any closer together. In fact, talks were actually suspended for a time because the mediator saw no possibility of agreement. So far, politicians have chosen not to intervene in the strike, clearly because of the upcoming elections in South Africa. Parliamentary elections will be held on 7 May, with presidential elections to follow in the second half of the year. The mine workers make up a major group of voters which neither the governing party ANC (African National Congress) nor the opposition parties wish to alienate. Polls indicate that the ANC is likely to win the elections, though it remains to be seen whether this will subsequently result in the necessary reforms being implemented which would also steer the mining industry into calmer waters. Recently, the South African finance minister played down the strike’s negative impact on the local economy, claiming that the current strike is causing less damage than the industrial actions taken two years ago. 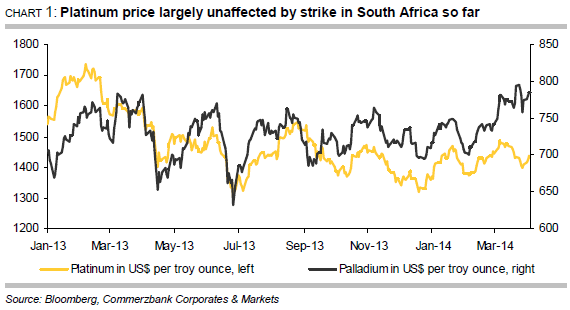 In 2012, a series of strikes cost gold and platinum producers more than ZAR 16 billion. By their own account, the mining companies concerned are losing 9,900 ounces of platinum production every day – 4,000 ounces at Anglo American Platinum, 2,800 ounces at Impala Platinum and 3,100 ounces at Lonmin. Assuming that work generally continues in the mines seven days a week, the producers have thus lost nearly 700,000 ounces of production since the beginning of the strike. The companies claim that they have lost revenues totalling over ZAR 11 billion as a result. So far, workers who are not being paid while they are out on strike have lost earnings of around ZAR 5 billion. Although production has been at a standstill since the beginning of the strike, the companies have been able at least partly to fulfil their delivery obligations by drawing on stocks. By their own account, the producers had piled up considerable stocks in the run-up to the strike, which industrial sources estimated would last two months. The situation is not the same in all the companies, however. Anglo American Platinum had for example announced at the end of March that it had used up half of its 430,000 ounces of stocks up to that point, saying that material would be bought on the market if stocks ran out. By contrast, Impala Platinum had already declared “force majeure” in early March and has no longer been able to guarantee deliveries since the beginning of April. Impala is likewise considering buying in material on the market in order to meet its contractual obligations. 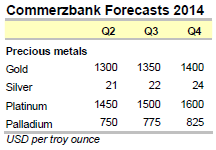 Lonmin had also downwardly revised its sales forecasts for this year at an early stage. Even if the strike can be brought to an end, it will take weeks if not months before platinum production achieves its pre-strike levels again. After all, the damage in shafts and galleries resulting from the lack of use first has to be identified and, most importantly of all, safety has to be restored. In some cases the companies are already talking about irreparable damage and are considering shutting down individual shafts entirely. There are also likely to be some redundancies because the companies claim that they will otherwise no longer be able to operate at a profit. This could spark renewed protests and set in motion a vicious circle which would harm the entire country. As far as palladium is concerned, we need to take a look at Russia. According to data from Johnson Matthey, Russia accounted for 42% of worldwide palladium supply in 2013 (primary production and reserve sales together totalling 2.7 million ounces) and for 14% of global platinum production (780,000 ounces), making the country the largest producer of palladium and the second-largest producer of platinum. The situation here is dominated by concerns about the extent to which possible sanctions imposed by the West on Russia could hit this sector and how Russia might react to further-reaching sanctions against its economy. That said, there are no signs so far that deliveries from Russia are at risk. According to the UK’s Financial Times, however, Norilsk Nickel, the world’s largest palladium producer, is currently negotiating longterm palladium and platinum supply contracts with Chinese and Japanese buyers. Although this might not mean anything, it could perhaps be viewed as a not particularly subtle hint to the West. 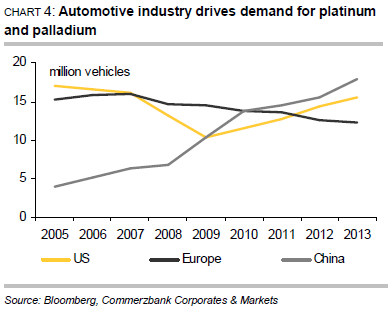 Driven by the automotive industry, demand for both platinum and palladium is robust. March saw the seasonally adjusted annualized vehicle sales rate in the US rise to 16.33 million units, the highest figure since May 2007. At 3.16 million units, car sales in China in January and February combined were a good 11% up on the same period last year. It would therefore seem that the 2014 target of an increase in sales of up to 10%, set by the China Association of Automobile Manufacturers, is achievable. The European auto industry may also have bottomed out, for car sales in February increased year-on-year for the sixth consecutive month (Chart 4). When it comes to investment demand, market participants evidently switched their allegiance from palladium to platinum in the first quarter. While the palladium ETFs tracked by Bloomberg recorded outflows of 51,900 ounces, the platinum ETFs saw inflows of 53,600 ounces. 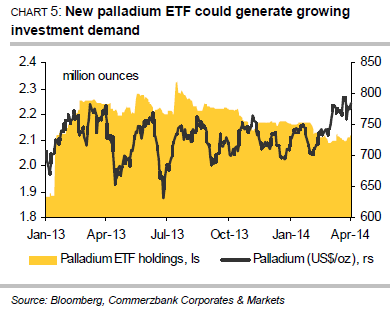 That said, the trend could soon be reversed in the case of palladium (Chart 5), for South African investment bank Absa Capital launched its long-awaited palladium ETF at the end of March. The ETF is listed on the Johannesburg Stock Exchange and solely sourced with palladium from South Africa. If the palladium ETF follows the same course as Absa Capital’s platinum ETF, which was launched at the end of April 2013, a great deal of supply could be stripped from the market. Within just four months of its launch, the platinum ETF became the world’s biggest platinum ETF and at the end of March had a market share of 37% with over 952,000 ounces. Holdings in all platinum ETFs combined are equivalent to more than five months of global mining production, while holdings in palladium ETFs equate to nearly four months of global production. In our opinion, risks to supply in conjunction with robust demand point to higher platinum and palladium prices. According to data from Johnson Matthey, the supply-demand situation was already tight on both markets last year, the global platinum market showing a supply deficit of 605,000 ounces in 2013 and demand outstripping supply on the global palladium market by 740,000 ounces. Assuming the supply problems are not resolved in the near future and demand remains robust, the situation on both markets will doubtless tighten further. By year’s end we continue to envisage a platinum price of $1,600 per troy ounce, while palladium is likely to be trading at $825 per troy ounce.